A good week and a busy week of the last BIG duties in the garden. The huge pepper planting job is done! We are excited about our pepper selections this year. Last year we tested out a few of the mini sweet peppers that are so delicious for quick snacking. Perfect for single serving and oh so sweet and beautiful. These plants performed well in the garden and we received a lot of positive feedback from members about how much they enjoyed them in the boxes last season. We dedicated a nice long row to these colorful minis called lunchbox and bangles. We also expanded our sweet bell plantings and planted more of those beautiful Bull Horns named Carmen. In our opinion the best for summer grilling. Hot Pepper choices we winnowed down to the delicious anchos and jalapeños. We are also testing a new jalapeño being offered for the first time that has the jalapeño flavor and no heat. We will see what we all think of this……The remaining pepper plants were donated to the Baraboo Food Pantry Garden and the Baraboo Community Garden Space. 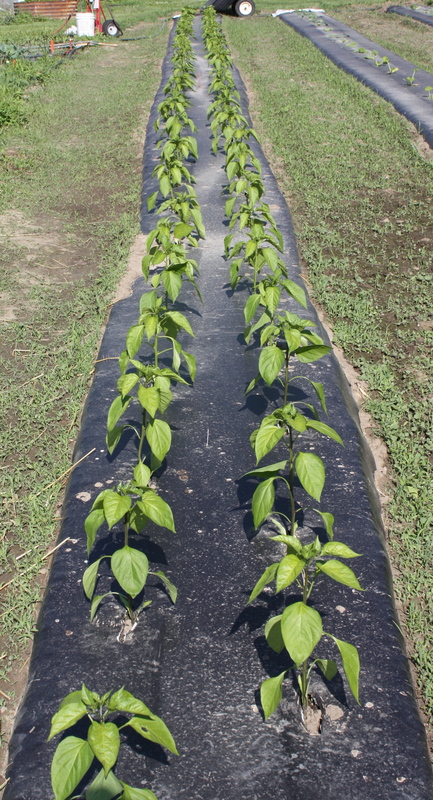 A nice long row of the mini sweet Lunch box and Bangles Peppers. Our assorted Sweet Pepper row. We plant these on reflective plastic mulch to increase yield. Scott covers the mulch with straw after we first plant to prevent “sunburn” with the intense sunlight. We will slowly brush back the straw as the plants settle in. The trellis went up for our cucumbers and I was right behind with the seedlings going in. Long thin skinned European beauties, TONS! of mini thin skinned snackers, those delicious white salt and pepper guys that are my favorites. We shortened the row of true pickling/eating cucumbers that we had an overabundance of last year and thought it would NEVER end. The cucumbers. We grow our cucumbers on a trellis for ease of picking and keeps them cleaner off the muddy ground. A nice long row of carrots are under the cloth row cover to the left in this photo. Other big duties checked off the list this week……spaghetti squash in, melons in, edamame in, a second planting of celery and celeriac, a 3rd planting of green beans seeded in, loooooooooooooong rows of beets and carrots seeded in the hoop house less than 24 hours after the green onions and spinach pulled and ground prepped. Hustle Hustle….. This week our gears shift to weeding and maintenance duties. Our first and second plantings of beets and carrots need attention. It is difficult to weed too early as the little seedlings need time to develop. Well, the weeds grow right along with them and they need to disappear. Fussy and time consuming to thin and weed. Our organic sweet potato slips arrived on Saturday and they are waiting until tomorrow to be planted as we were focused on harvest over the weekend. 500+ slips will go in the ground for early Fall harvest. The tomato plants have settled in and now require support on the trellis. We grow our tomatoes on panels in an espalier fashion. Wide rows and lots of airflow improves production. This is a picture from last year. 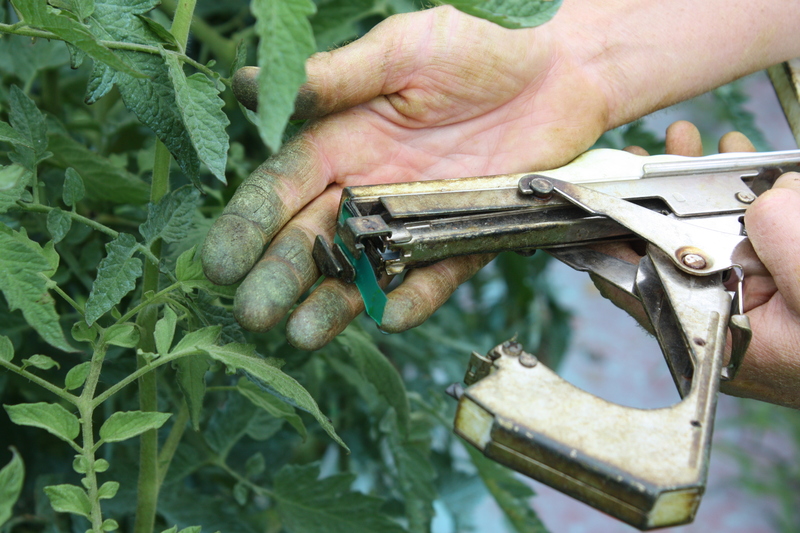 Tying up the tomatoes….This tool is a huge time saver. 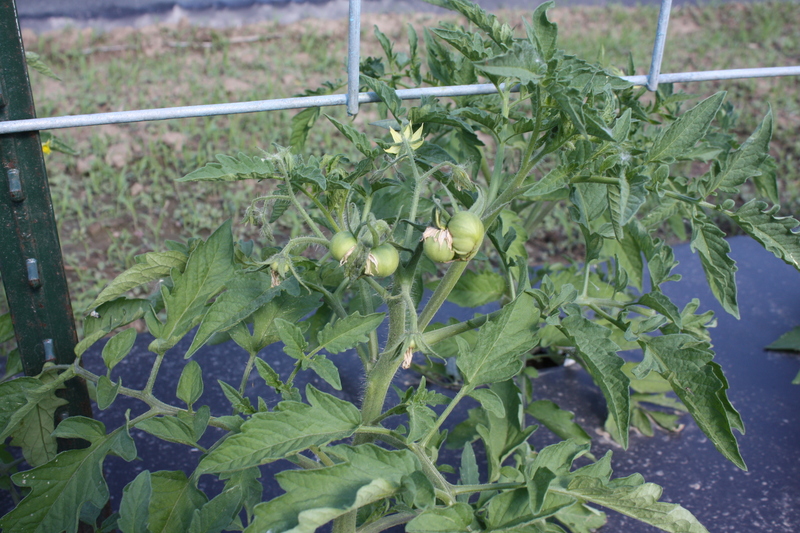 Tomatoes already developing on the vines….the plants are loaded with blossoms and we wonder if we will have early tomatoes this year. 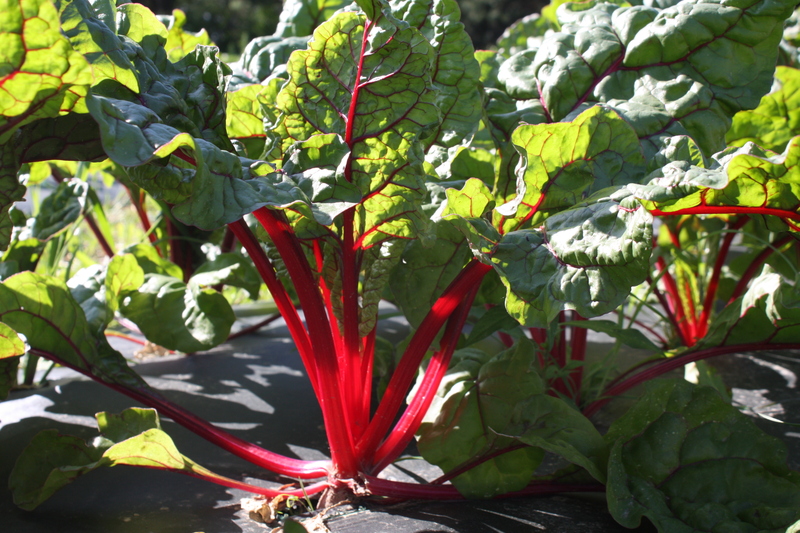 The garden is beautiful at this point in the season…..a quick tour…..
Next week’s Swiss Chard harvest. Gorgeous! 176 pounds of garden goodness went out the door today! Harvest this week went smoothly. We are comfortable with the volume required and the time needed to clean and process the produce. Very little “freak out” on my part. 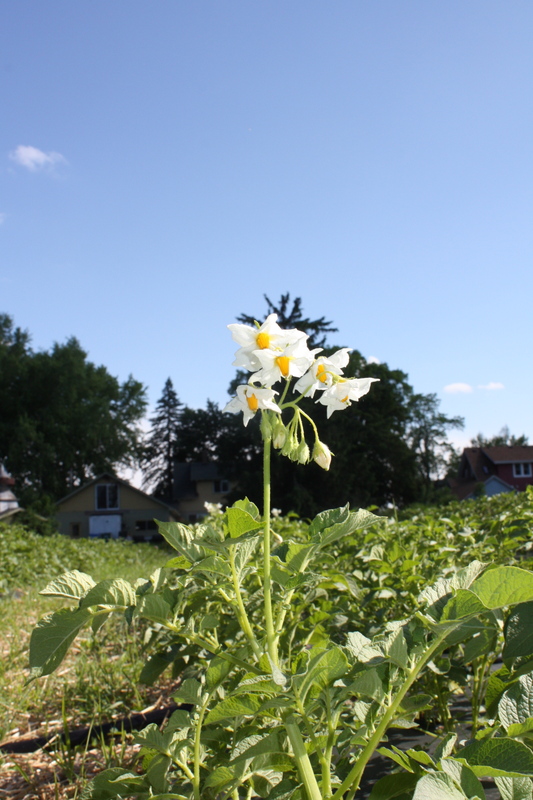 The plants matured as expected and the weather cooperated. 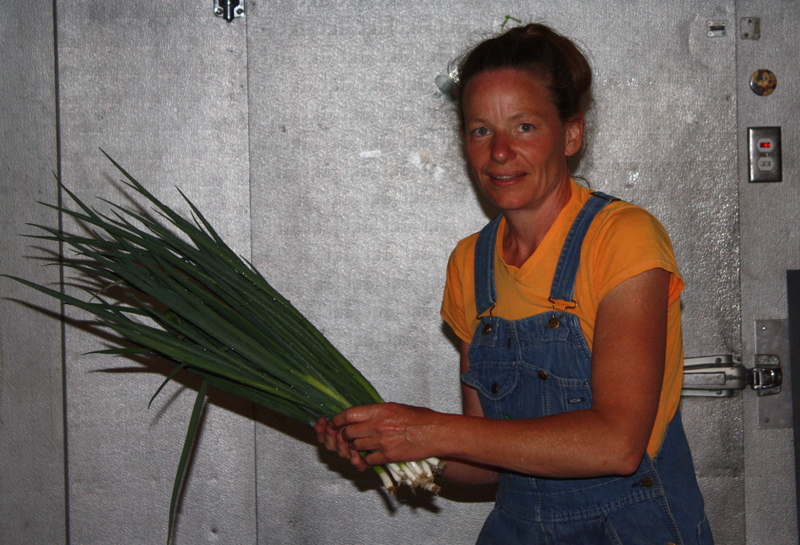 Counting out the green onion harvest. 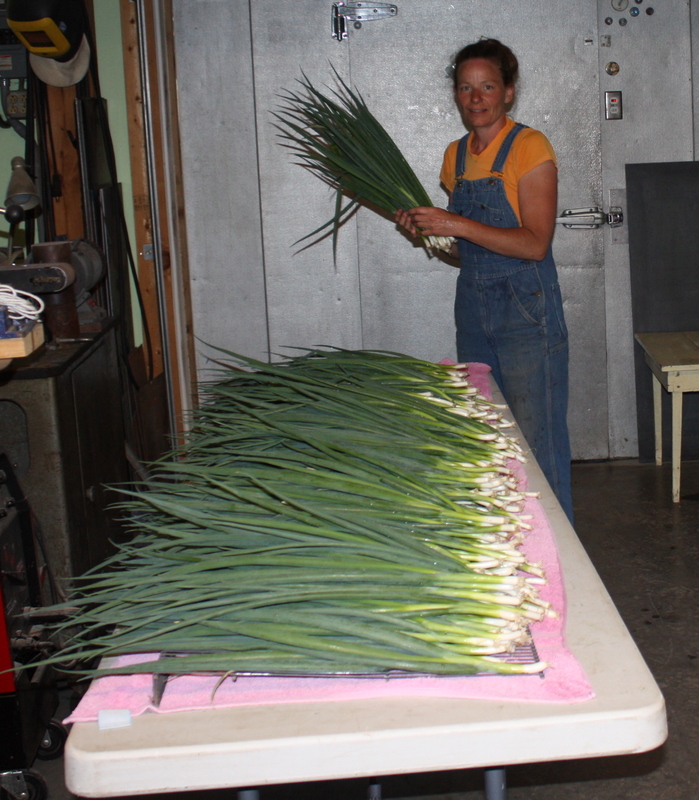 Bundles of Green onions ready to be banded….it looks like I am a huge fan of the “spray tan” this year! Major flash glare on the chalk board today……sunlight “issues” by the cooler. Lettuce-A nice juicy head. Lettuce is perfect at this time in the season. Cooler temps and slower growth. Radish Medley-The last of the radishes for awhile. 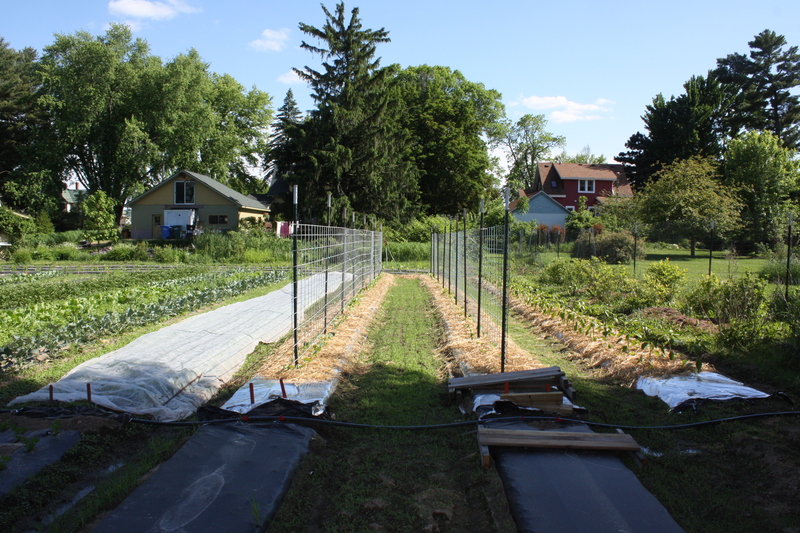 We have cleared the beds and waiting to reseed a few weeks…They hold well in a sealed bag in the refrigerator. Asian Green-This variety is called Tokyo Bekana. Bright lime green ruffled leaves. A bit like a loose Chinese cabbage in flavor and texture. 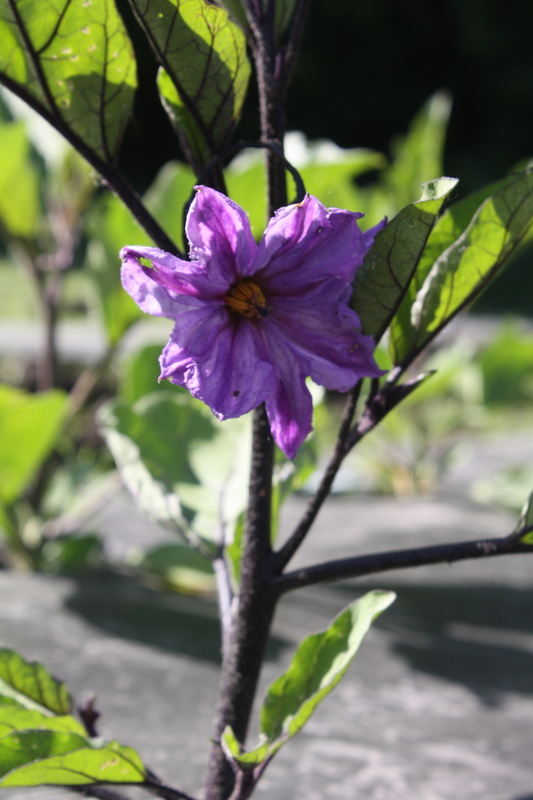 Can be enjoyed raw in salads or sautéed. Delicious and a favorite in our house. Green Onions-A nice bunch of mild beauties. These were started from seed in Feburary and harvest from the hoop house. Broccoli-A snack sized bag from our early broccoli trials. Small head formation due to the quick transition to summer heat but deliciously tender and flavorful. Mini Basil Bundle-The Basil plants got a haircut. A sweet treat for a pasta dish or added to fresh salads. Mini Lettuce Heads-Deep green bib lettuce heads. Radish Medley-The last of the radishes for awhile. 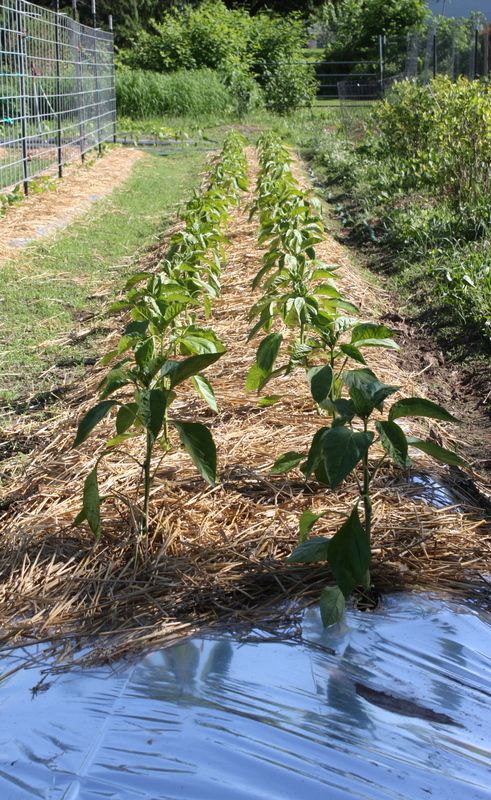 We have cleared the beds and are waiting to reseed a few weeks…They hold well in a sealed bag in the refrigerator. Spinach-A BIG juicy bag and the end of this cool loving Spinach crop until Fall. 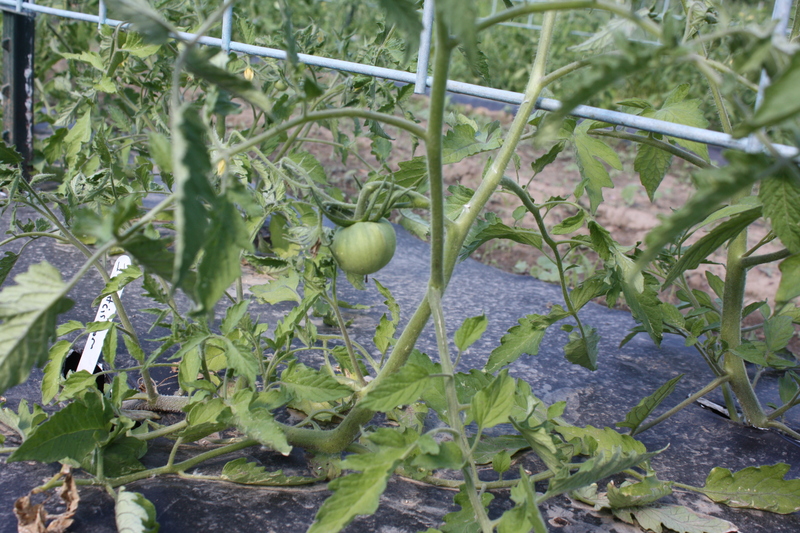 The plants were thinking about bolting and production goes way down too in the heat so we pulled the plants. We have 2 long rows of baby spinach planted. This 2nd variety can withstand the heat a bit more and should be ready in the next week or 2. Kohlrabi-A few early heads in all full share boxes. A Maeve favorite and several plantings already in the garden. These will appear again in future boxes throughout the season. Our entertainment during box prep. Maeve practicing “flower girl duties” for a fictitious future wedding. Remember to return your share boxes and bags each week for future reuse. Thanks!